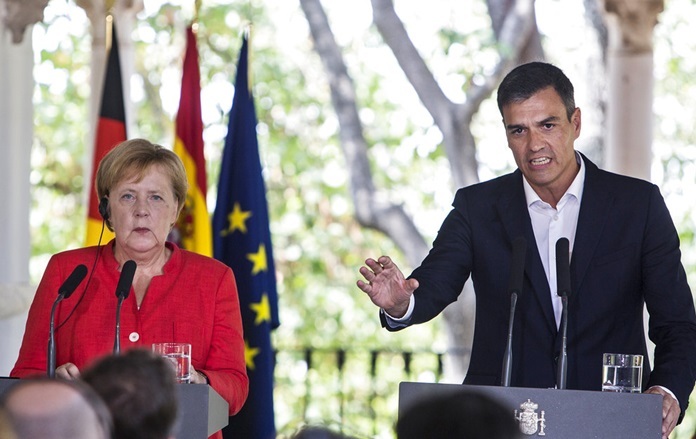 German Chancellor Angela Merkel and Spanish Prime Minister Pedro Sanchez, meeting at a country estate in the southern region of Andalusia, advocated a “fair distribution” of migrants for EU nations. They said they will share their common vision at an EU summit next month in Austria. Spain has become the primary destination for migrants attempting to reach Europe by sea in recent months. While largely welcoming, Sanchez’s Socialist government is trying to stem the flow of migrants across the Mediterranean by holding talks with Morocco, one of the main departure points now used by traffickers to cross the sea. The International Organization for Migration says almost 24,000 refugees and other migrants have arrived in Spain by sea this year — nearly triple last year’s number. At least 1,500 other migrants have died so far this year in the dangerous Mediterranean crossing. Merkel has been seeking bilateral agreements with Spain, Greece and Italy to stop so-called “secondary” migration to Germany, an issue that nearly took down her government several months ago. Negotiations with Greece and Italy are ongoing.